When one mentions tourism, a special chapter has to be devoted to Antalya. 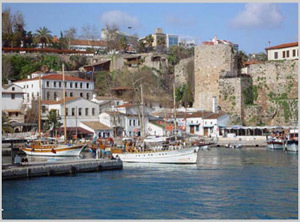 Together with Istanbul, Antalya is the driving force of tourism in Turkey. It is a province that offers tourism opportunities and facilities all around the year. The types of tourism available in Antalya are culture tourism, sea, sports, health, winter, convention, alm, cave, camping and faith tourism. There are facilities for all these tourism options. Culture tourism is more prevalent in the coastal areas. In this region the Old City (Kaleiçi), historic buildings, mosques and churches can be found. In the coastal areas boat tours are also quite popular. The best known coastal tourism spots are Kleopatra, Konyaaltı and Lara beaches. In terms of sports tourism, Antalya has hosted many popular sports branches. Antalya hosts hundreds of sportsmen and teams each year, the majority consisting of football, tennis and golf. Between 2009-2010 Antalya hosted 177 sporting events; 39 international, 66 national, 27 national team camps and 45 courses and seminars In addition Antalya has hosted the leg of the World Rally Championships between 2003-2008 and in 2010. Even though Antalya is known for summer tourism it is one of the foremost winter destinations of the country. The Saklıkent Ski Center is the major skiing resort in Antalya. In terms of convention tourism Antalya offers many amenities thanks to its ease of access and numerous means of transportation. It has many accommodation and recreational facilities with a capacity of more than 106,000 total seats that offer many opportunities to host important meetings for guests from all over the world. Antalya was established at the foot of the Taurus Mountains and the basic structure of these mountains is composed of limestone.. The vast majority of caves in the province were formed out of these limestone formations. Around 500 caves have been identified in Antalya. Antalya is also open to caving tourism. Three caves are open to the public, whereas 28 caves are either waiting to be opened to tourism or already have been made accessible through local means. Faith tourism is a tourism branch that shows promise. Antalya has many mosques, especially from the Seljuk period. Of these, Murat Paşa Mosque and the Fluted Minaret Mosque are the oldest mosques.